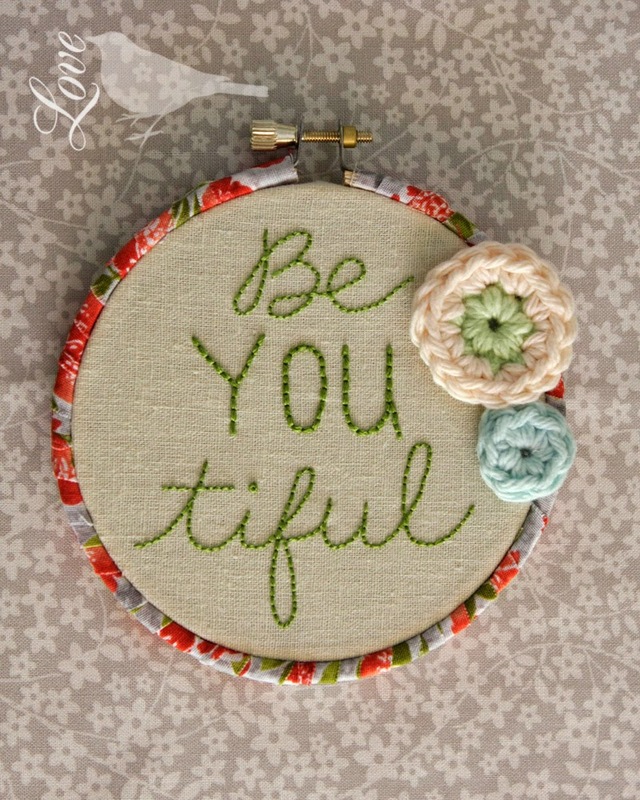 There is nothing wrong with a natural wood embroidery hoop, but with a few craft supplies you can really make them stand out. Some supplies you already have on hand. 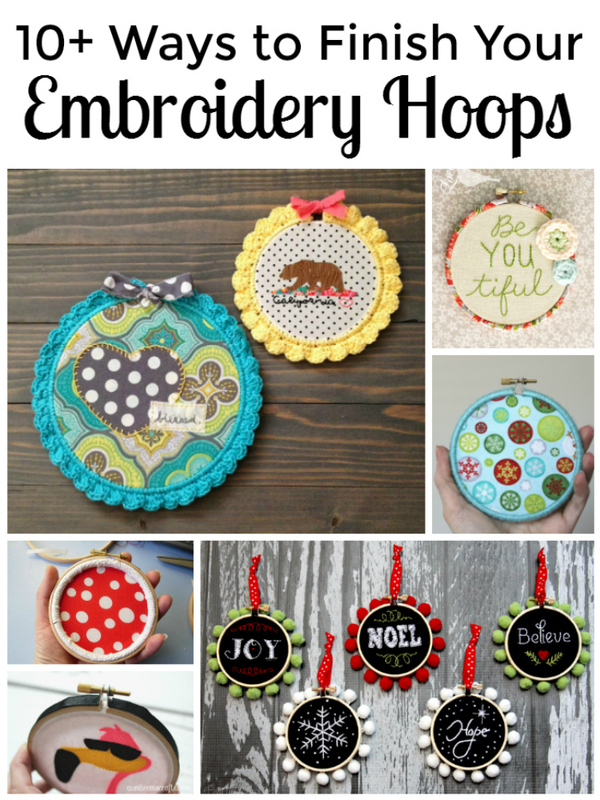 Here are several ways to finish your embroidery hoops to give them a boost of personality. 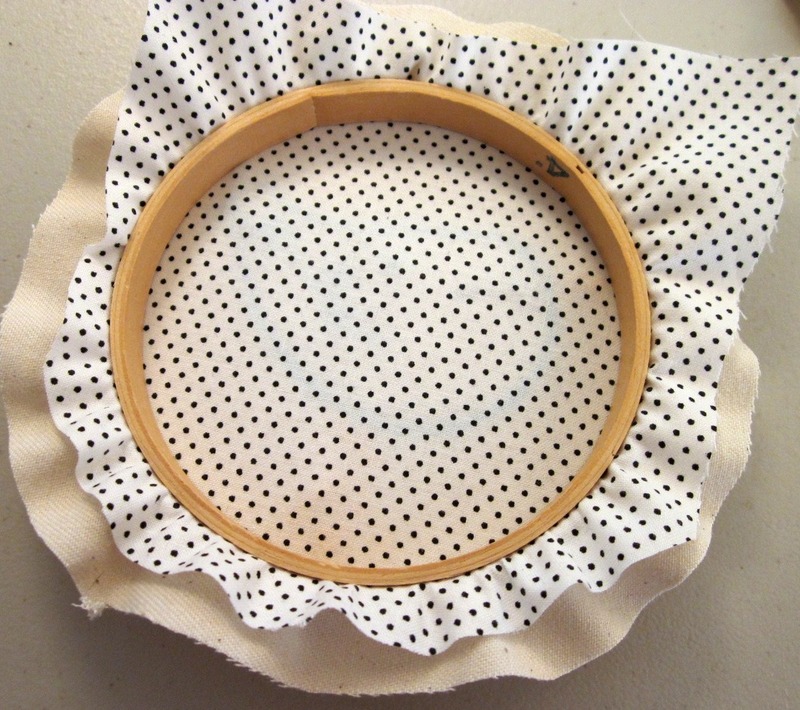 Use double sided sticky tape to adhere a coordinating piece of ribbon onto the outside of the hoop. Add a dab of tacky glue by the fastener to make sure it holds well. This method is perfect for me. 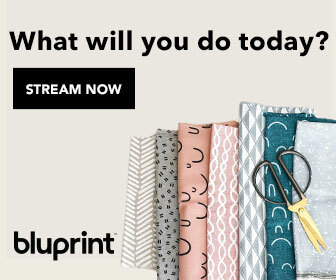 I have lots of fabric! The finished product is really cute too. You could do a similar look as above with yarn instead. 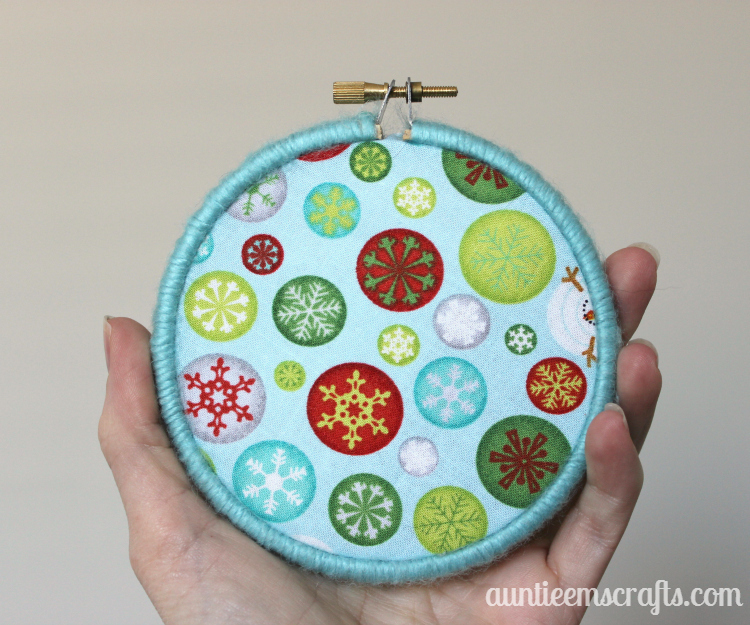 I used this method on some Christmas ornaments a few years ago. While cute, this method takes some patience. 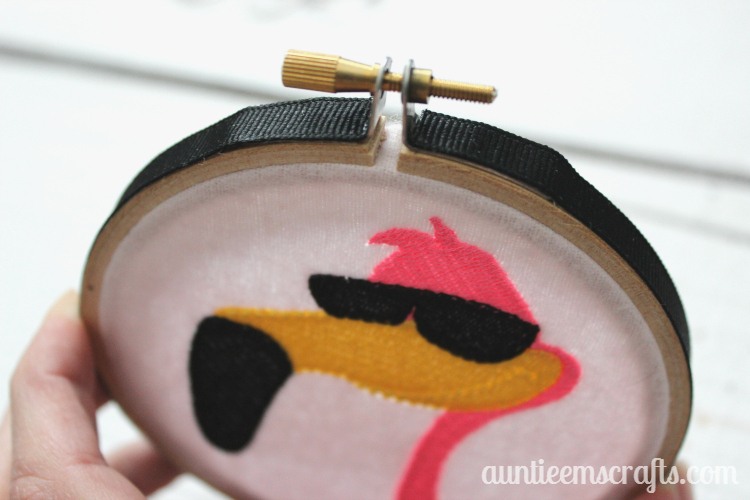 Using acrylic or spray paint will allow you to match your hoop to the fabric or thread that is being showcased. 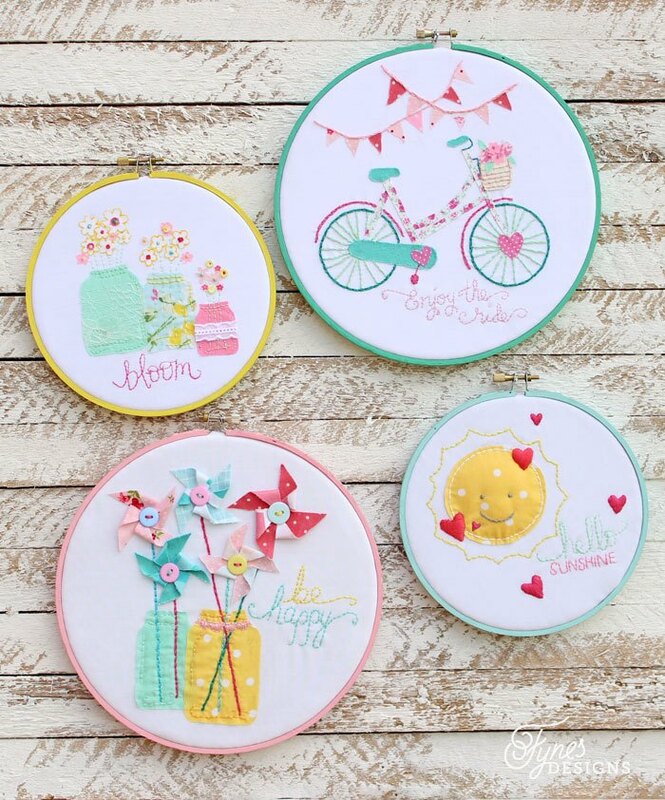 The bright colors that Fynes Designs used really make the hoop art pop. 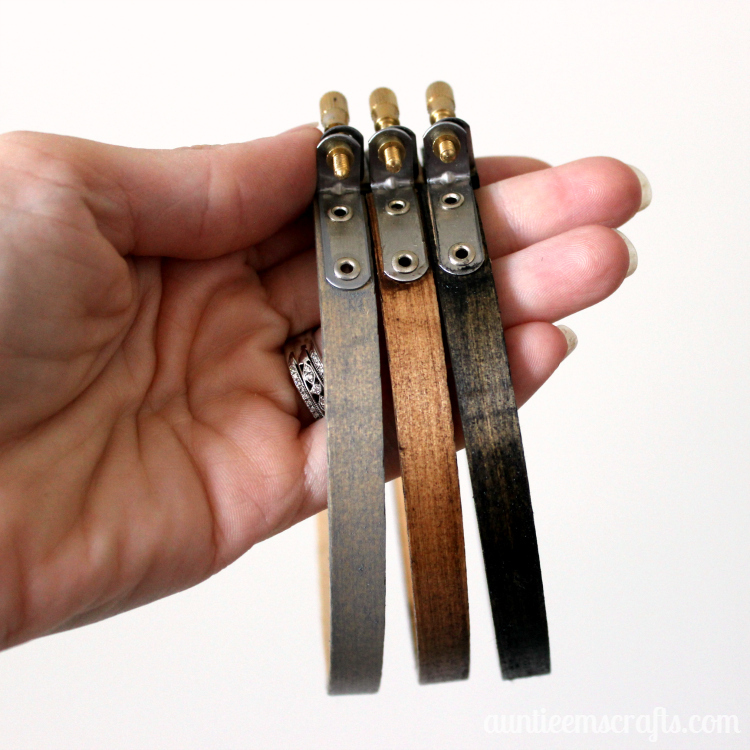 I used some Rust-oleun stain on these three hoops…. From left to right, Weathered Gray, Dark Walnut, and Ebony. Each one took several coats but hardly any time at all. 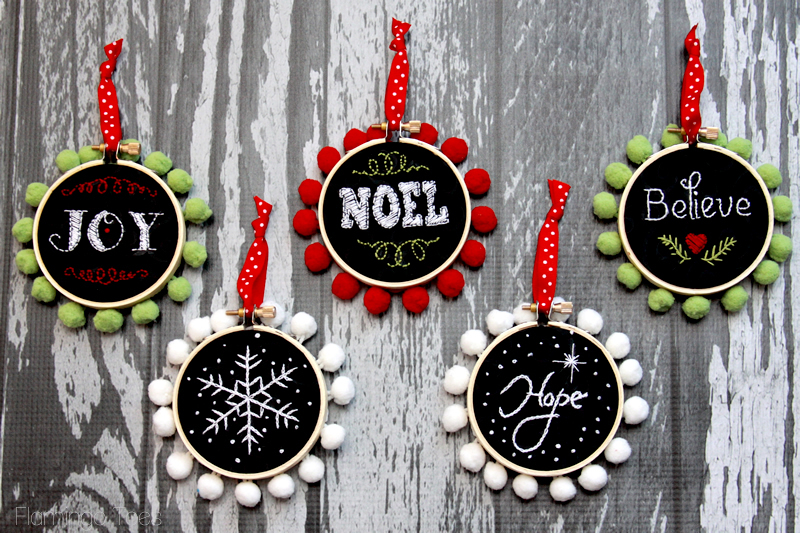 I couldn’t actually find an example of an embroidery hoop that has been dyed, but you could color them just like you would any other piece of wood. 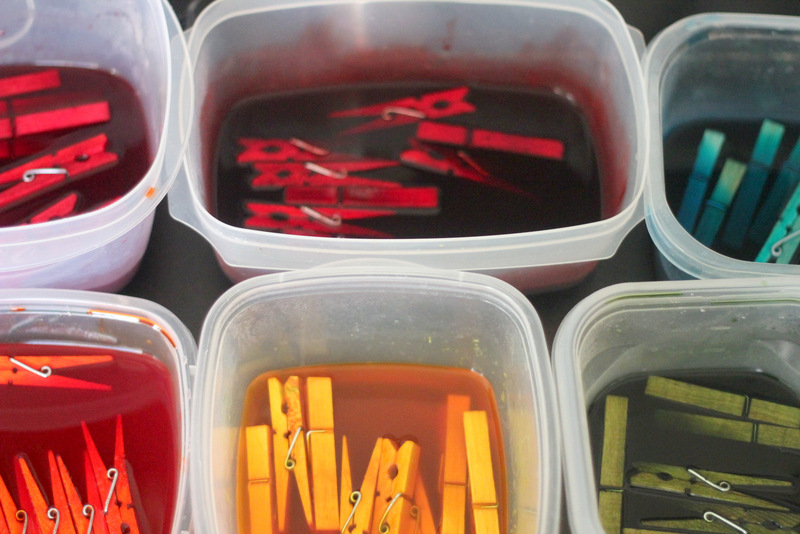 Kojo Designs used RIT to dye her clothespins. 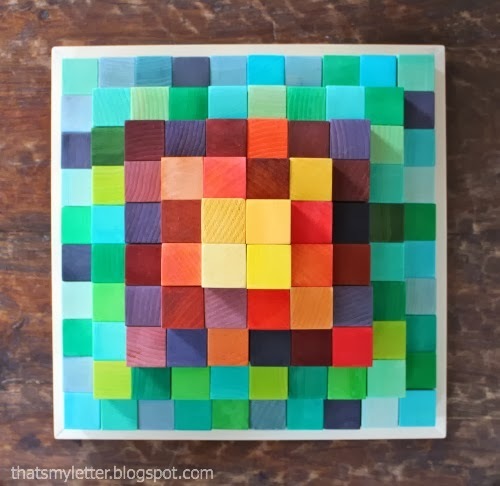 That’s My Letter dyed her wooden blocks with food coloring. This method is cheaper than the RIT, and you probably already have a set of the gel food colors in your pantry. The downside is that you paint the color on, whereas you can let the hoops dye themselves in the RIT. Flamingo Toes embellished these little ornaments with mini pom poms. How fun! I’m still a beginner when it comes to crochet, but I’d like to give this one a shot. 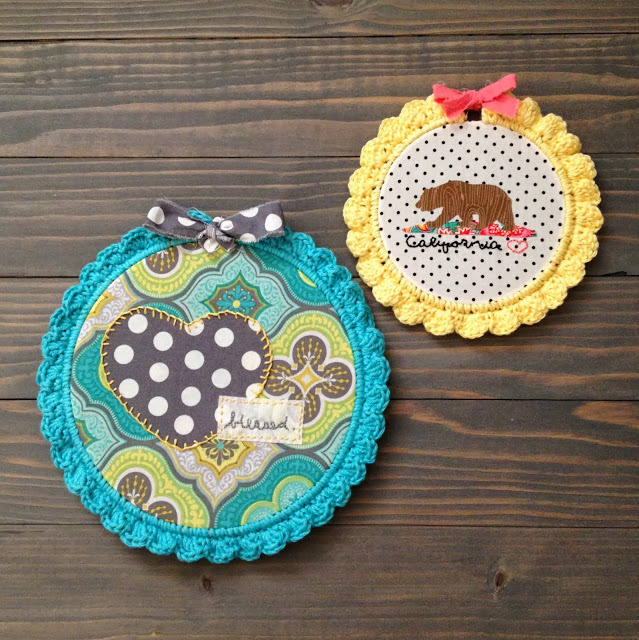 This tutorial is from Sew Chatty. 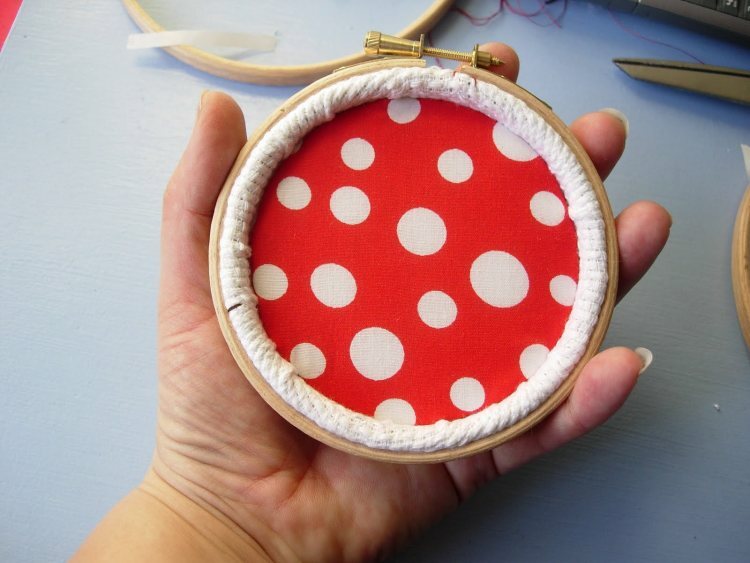 I like this tutorial from Sew Mama Sew. 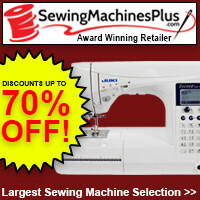 It gives a nice clean finish and would help you practice hand sewing skills (if you need them, like me). 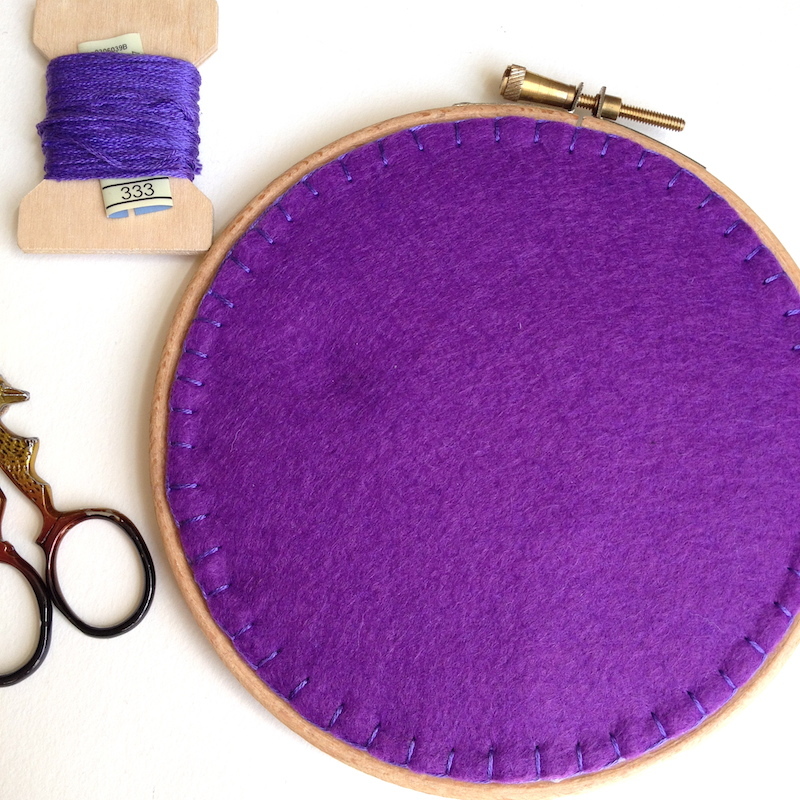 This method from Maximum Rabbit Designs adds a second circle and stuffing which gives a puffy finish to the front of the hoop. 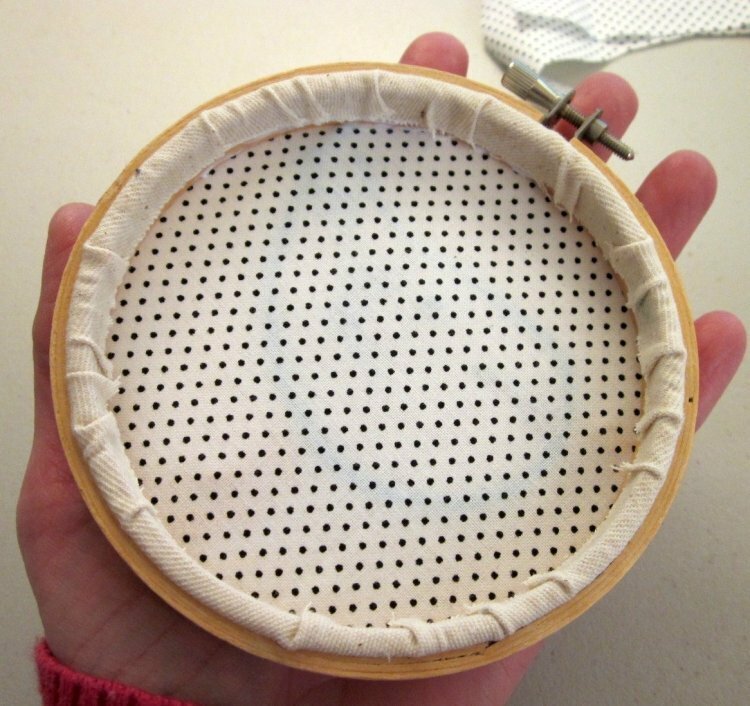 And last, but not least, this method uses a second piece of fabric to finish off the hoop but it a different way than above. This method looks easier and faster than the other two.